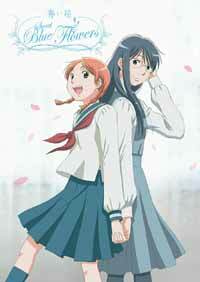 Distributor: Currently licensed by Right Stuf International. Fumi and Akira have reconnected as best friends after being separated for years when Fumi moved away. A lot has changed since then: they go to different high schools, Akira has a doting older brother who follows her around, and Fumi is struggling with her relationships as a young lesbian. What hasn't changed is their deep love for each other. We should all be so lucky to have the kind of relationship Fumi and Akira share. They aren't lovers, but friends who care so deeply for each other that they would feel lost if they were ever parted again. And they never have to say that out loud. Unlike other series, where we are regularly reminded these characters are friends, we know. We know by how they act with each other, how they look at each other, and how they talk to each other. It's the kind of intimacy that only comes once in a lifetime, if you're lucky. It should inspire jealousy. Based on the acclaimed manga by Takako Shimura that's widely considered a classic in yuri fan circles, the series painstakingly recreated the mellow mood of Shimura's art with gentle music, subtle dialogue and beautiful watercolor backgrounds. But that atmosphere belies a harsher, more realistic storyline, and though that mood sometimes makes it feel like the plot is just gliding on rails, so to speak, it rightens itself fairly quickly. As the series opens, Fumi's heart has just been broken by her older cousin, who will soon be marrying. Fumi feels betrayed after just becoming honest with herself over feelings for her. Reuniting with Akira after a ten year absence eases the pain, but she still feels lost and confused. Then a popular older student at the all girls high school asks Fumi out on a date, and a new fragile relationship begins. It's not a spoiler to say that this courtship, which is the main plot thread in the series, doesn't last. It can't last- it's a relationship built on delusion and desperation. Some of us have been there before- if so, you'll recognize it immediately. And seeing it coming doesn't make the heartbreak any easier. The characters are fully thought out, from Akira and Fumi to their family and their friend's families. Even the parents feel like people you've met before, and it makes the drama feel even more real. The series packed such emotional punch for me I felt guilty for watching most of it over a two day period- it would have been better to slow down and digest it episode by episode, meditating on it, if you will. Our hobby is filled with fantasies. I see nothing wrong with that- in fact, it's one of the reasons I love it- but in a world of convenient lies and easy fictions people hunger for truth. Aoi Hana has that; it honestly reflects something about us and how we interact with each other. Recommended Audience: Best watched by emotionally mature folks who have been through their share of heartbreak.